Bergen is renowned for its plentiful rainfall (and has been nicknamed the City of Rain or the Seattle of Europe), which makes up most of the 2250 mm (88 in) yearly average precipitation. For some years there were paraplyautomater (umbrella vending machines) installed in the streets, however, they did not turn out to be a success. A joke is told in Bergen about a tourist asking a local boy if it ever stops raining. "I don`t know, replies the boy, I`m only twelve." Another story is told,that horses were frightened when they saw a man without umbrella. Bergen is one of the warmest cities in Norway, thanks to the Gulf Stream. 10°C and rain can happen both in January and July. The warmest temperature ever recorded is 31.8°C in 1947, the coldest ever recorded is -16.3°C in 1987. It is the second largest city in Norway; the population of Bergen municipality is 242,854 as of April 1st, 2006 The city is located on the south-western coast of Norway, in the county of Hordaland, with its center situated between a group of mountains known collectively as de syv fjell ("the seven mountains"). Bergen is recognized as the unofficial capital of the region known as West Norway, and also recognized and marketed as the gateway city to the world famous fjords of Norway and for that reason it has become Norway`s largest – and one of Europe`s largest cruise ship ports of call. The city of Bergen was founded by king Olav Kyrre in the year 1070 AD. Bergen celebrated its 900th anniversary in 1970. It was considered to be Norway`s capital in the 13th century until 1299. 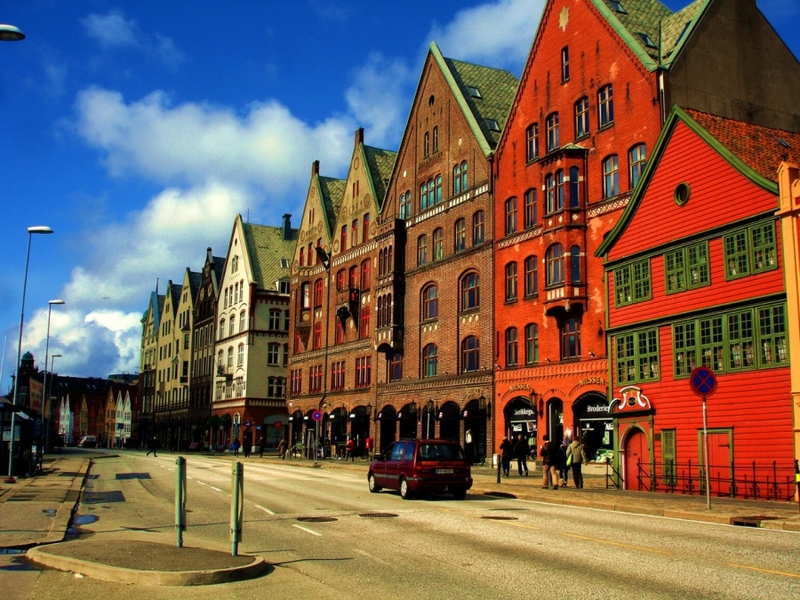 Towards the end of the thirteenth century, Bergen became one of the Hanseatic League`s most important bureau cities. The main reason for Bergen´s importance was the trade with dried cod from the northern Norwegian coast, starting up around 1100. The German Hanseatic merchants lived in their own separate quarter of town, where Low German was spoken, enjoying exclusive rights to trade with the northern fishermen that each summer sailed to Bergen. Today, one still gets a feel of this at the quayside of Bergen called Bryggen, today on the UNESCO list of World Heritage sites. The oldest part of the city is on the north side of the bay of Vågen. Here you find Bryggen, a number of old, wooden houses from the early 18th century, the product of rebuilding after a fire in 1702, done in the style of the medieval buildings that stood on the site before the fire. A popular tourist attraction is the open air fishmarket on the harbour. Further down you find the main shopping area, rebuilt after a fire in 1916 in art nouveau and functionalism, around the main square Torgalmenningen. Several old quarters of white, wooden houses are patched in and around the centre, notably in Nordnes, Marken and Sandviken. Nygårdshøyden is a quaint area with a large number of buildings from about 1900, many with neoclassical facades. Some parts of Bergen have been rebuilt after WWII due to English bombing, an explosion accident and unthoughtful city planning. Whole blocks of ancient wooden houses are still regularly demolished in the city centre, most recently in Nøstet and Krinkelkroken. Strolling around in Bergen will generally reveal areas of very differing architecture. Visitors should not miss the ride with the funicular up to Mount Fløyen, where one is rewarded with a splendid view over the city and the fabled seven mountains. From here, it`s also possible to hike in a huge area of spectacular and largely untouched scenery. The aquarium with seals, penguins and fish from the area is also popular.